Eighty years ago this month, in July of 1933, musicologist John Lomax and his 18-year-old son Alan met and recorded Huddie Ledbetter, a singer and 12-string guitarist, at the Louisiana State Penitentiary in Angola, West Feliciana Paris, Louisiana. Huddie, who went by the name “Lead Belly,” was an inmate at the Penitentiary. The Lomaxs were on a song-collecting trip through the South for The Library of Congress. But, if you’d like to hear the commercially-unavailable July, 1933 recordings of Lead Belly, you’ll have to go to Washington, D.C. and visit The Library of Congress. This past March, I made that trip. 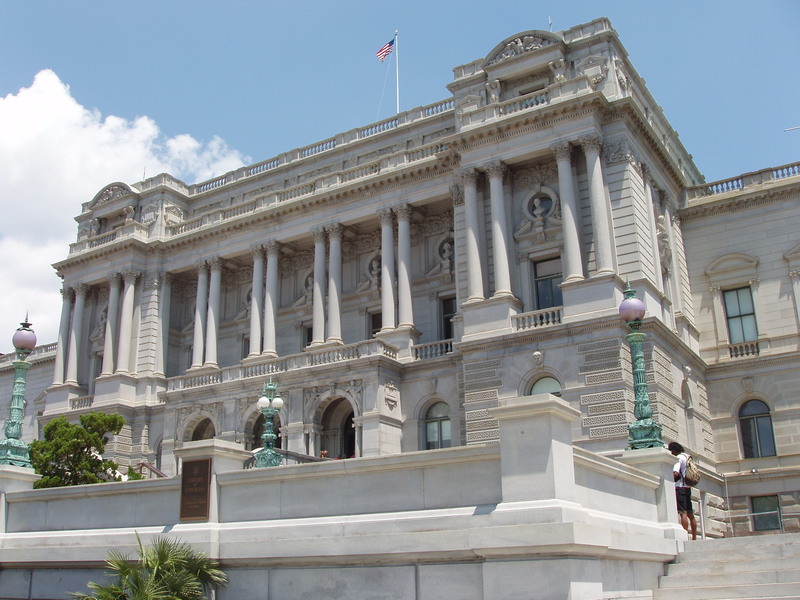 The Library of Congress is located on Independence Avenue, SE, a short walk from the Capitol South Metro stop. The July, 1933 recordings of Lead Belly are part of The Alan Lomax Collection and the Curator of this collection is Mr. Todd Harvey. Mr. Harvey’s base of operations is The American Folklife Reading Room, which can be found in the Jefferson Building of The Library of Congress. 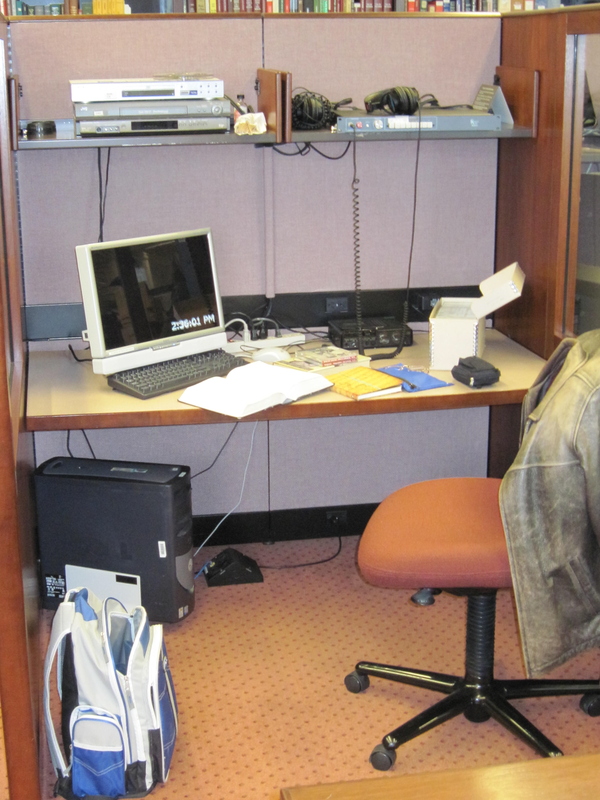 Having visited The Library of Congress once before (in June, 2011), I knew that you needed to have a “Reader Card” in order to do research in The American Folklife Reading Room. To get this card, one must visit the Madison Building of The Library of Congress, which is right next door to the Jefferson Building. …and directed me to a well-equipped listening station. Mr. Harvey also handed me the Reading Room copy of an essential reference book: Blues & Gospel Records 1890-1943 (4th Edition) by Dixon, Godrich & Rye. On the first page of the listings for Huddie Ledbetter, Mr. Harvey showed me the song titles and corresponding catalogue numbers for the July, 1933 recordings. 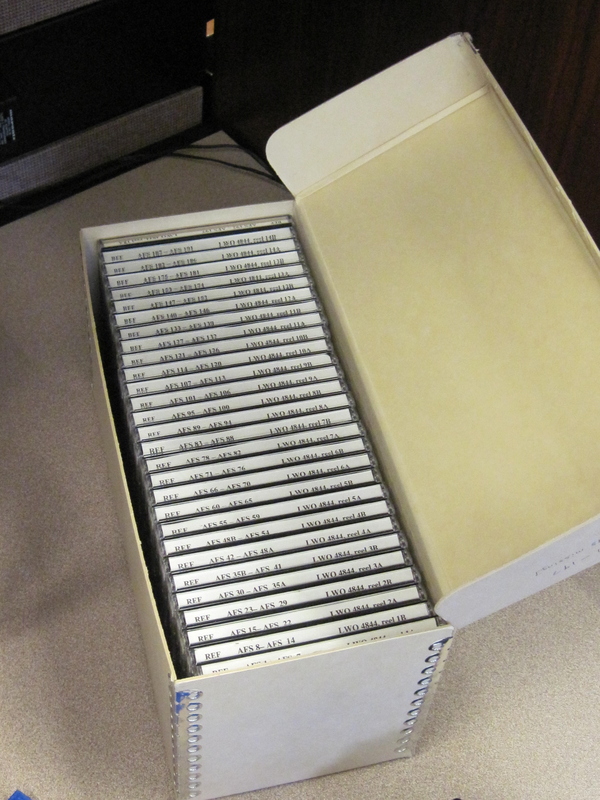 Good thing, because the CDs in the box were only labeled with the catalogue numbers! Before long, I had the headphones on and was listening to the first piece Lead Belly performed that day for the Lomaxs’ recording machine: “The Western Cowboy” (#119-B-1). Here’s what I wrote in my journal about this and the recordings of seven other songs made that long ago day in Louisiana. Not only were these short, incomplete versions of the songs, but there were several tracks where you hear the sound of the disc coming up to speed as the machine starts to record. Some tracks obviously end before Lead Belly had stopped playing. Through the morning, as I listened several times to them all, the answer became obvious as to why these recordings had never been commercially released. Biographer John Szwed, writing in his 2010 book Alan Lomax: The Man Who Recorded The World describes that recording equipment as “a 315-pound disc-cutting recorder, a vacuum tube amplifier, two seventy-five-pound Edison batteries to power them, a generator for recharging the batteries, piles of aluminum amd celluloid blank discs, a mixing board, a loudspeaker, a microphone, and boxes of replacement parts,” all stuffed into the rear of a Model A Ford. Considering that their previous field recorder had been an Edison phonograph-like machine called the “Ediphone” that recorded onto cylinders and was intended for business use in an office, I’d say that the Lomaxs were lucky to have captured as much of Lead Belly’s performances as they did. Despite all the technical difficulties and resultant drawbacks of these first recordings, Lead Belly’s powerful, vibrant voice and virtuosic 12-string guitar playing come shining through. For instance, Lead Belly sings that lone verse in the first take of “Irene” – a lyric I’d never heard before – with the relaxed confidence of a seasoned musician performing before a large audience; rather than for two strangers and their strange machine in a small room, in a prison. Thanks to the extensive list of catalogue numbers in Blues & Gospel Records for the recordings of Huddie Ledbetter, I soon discovered that the box of CDs I was working from also contained the recordings that the Lomaxs made of Lead Belly when they returned to Angola in July of 1934! Since the Lomaxs had by then become experts at using their recording equipment, these recordings are of complete songs – all the verses and choruses! – and feature stunning performances by Lead Belly. They made for some fascinating and revelatory listening. Of the recordings in this group that are not commercially available (on CDs released by Rounder and Document Records and on iTunes), the song called “I Got Up This Morning, Had To Get Up So Soon” (#122-A-2) was especially enjoyable. Towards the end of my visit to the American Folklife Reading Room, and at Mr. Harvey’s suggestion, I listened to a few tracks from a CD of pleasant but not particularly distinguished music by Blues singer & guitarist Calvin Frazier. Mr. Frazier’s claim to fame was that he played back-up guitar in 1930 for Robert Johnson. Entitled This Old World’s In A Tangle, the recordings on the CD were made by Alan Lomax in 1938. Quite obviously, we all owe a huge debt of gratitude to The Library of Congress for providing the resources and to John & Alan Lomax for having had the vision and determination to make their many, song-collecting trips and for finding and forever preserving the music of not only Lead Belly, but the hundreds of other musicians whose music, voices and names would have otherwise disappeared and been forgotten. I would also like to extend a personal thank you to Mr. Todd Harvey for helping to make both of my visits (so far) to the American Folklife Reading Room as exciting, informative and memorable as they were. So, what should I listen to on my next trip to The Library? This entry was posted in Random Topics and tagged Alan Lomax, Angola Penitentiary, Field Recording, John Lomax, Lead Belly, The American Folklife Reading Room, The Library of Congress, Todd Harvey. Bookmark the permalink. What a fabulous trip this must have been. And how fortunate we are to live in an era when these fragile recordings can be digitized to preserve them for generations to come.